An easy homemade garlic bread recipe featuring a simple garlic bread spread made up of butter, oil, garlic, and Parmesan cheese. Perfect for serving alongside pasta, soups, and salads! Ah, homemade garlic bread — the ultimate pasta night side dish. Come to think of it, what else would we serve alongside a perfectly saucy dish like spaghetti and meatballs or fettucini alfredo? A side salad perhaps? Sure, that would be fine-and-dandy, but we all know what we’re really craving. Something to scoop up that extra sauce, something hot, buttery and toasted. Let’s just be honest. What we really want is the garlic bread. Cause when it comes down to it, bread is bread, and lettuce is….well, lettuce. We know who the real winner is here, folks. But, just in case you’re feeling a little bit in the dark, it’s bread. Obviously, every time the winner is bread. And you’ll be a winner too. As soon as you get this recipe under your belt. So here we go — homemade garlic bread for the win. Homemade garlic bread begins with…you’re never gonna guess…bread! But, not just any bread — fresh bakery bread to be more precise. Swing your cart into the bakery section of your local grocery store and snag yourself a bag of French stix. French stix are the ideal circumference for garlic bread toasts, just a little bit larger than a baguette, but not quite as large as a regular French loaf. However, if your store doesn’t carry French stix, substituting either the French loaf or the baguette is perfectly acceptable. You can go about cutting the bread one of two ways: Either cut it down the middle lengthwise or cut it crosswise into toasts. I prefer my garlic bread to be cut into toasts cause the outside gets all crispy and the inside stays nice and soft, and it is overall completely heavenly. However, slicing the loaf down the center and baking it that way is also perfectly acceptable and delicious. 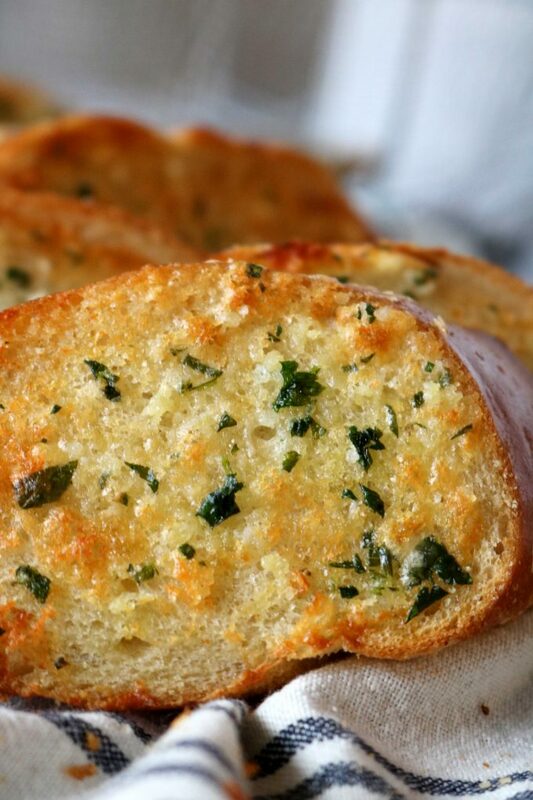 Don’t freak out or anything, but the mixture that makes up garlic bread spread? It’s actually a compound butter. I know, scary kitchen terminology, super easy thing to do. 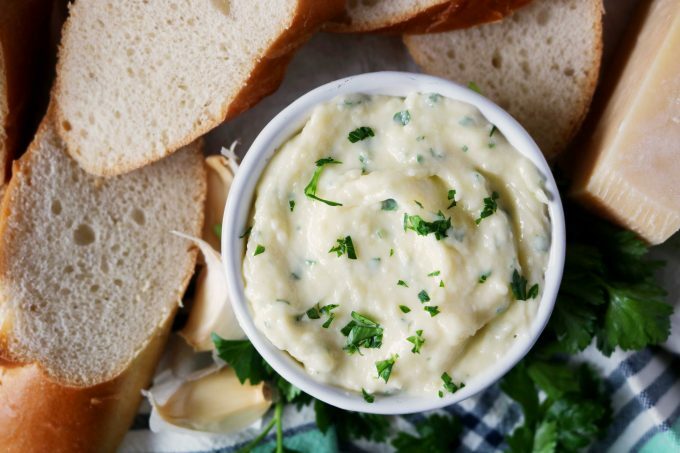 Garlic bread spread is made up of butter, oil, and seasoning. This one also has Parmesan cheese. So, you’re welcome. When mixing up your spread, it is important that the butter is softened or at room temperature before you begin. This way the oil and butter will blend together seamlessly. The reason we use a combination of both butter and oil for garlic bread spread is so that butter doesn’t burn under high heat in the oven. The oil helps to lower the smoke point of the mixture, keeping things golden-brown rather than black-and-burnt. Amen for that. In addition to the butter and oil, minced parsley (I prefer fresh, but you could use dried), Kosher salt, and a lovely dose of freshly grated Parmesan cheese. Oh, and the garlic. Let’s not forget the most important part. The garlic for garlic bread should be minced as fine as possible, because as wonderful as garlic is, it’s a tad pungent and a little bit goes a long way. The finer we mince, the more coverage our bread gets, the better it is. The garlic bread spread gets mixed together either using a fork, whisk, or the food processor, then it’s ready for spreading. The bread is baked in the oven and that’s all there is to it! Side dishes don’t get a whole lot easier than that. It’s quick and simple to make, so much better than any store-bought version, and the perfect companion to any pasta night. Please, enjoy. 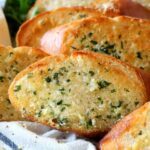 An easy homemade garlic bread recipe featuring a simple garlic bread spread made up of butter, oil, garlic, and Parmesan cheese. Preheat the oven to 425° and have ready 2 sheet pans. In a small mixing bowl, whisk together the butter and olive oil. Stir in the Parmesan cheese, garlic, parsley, and salt. Apply a thin layer of the mixture to each slice of bread and transfer to the baking sheets. Bake 5 minutes, or until golden. Serve right away and enjoy. 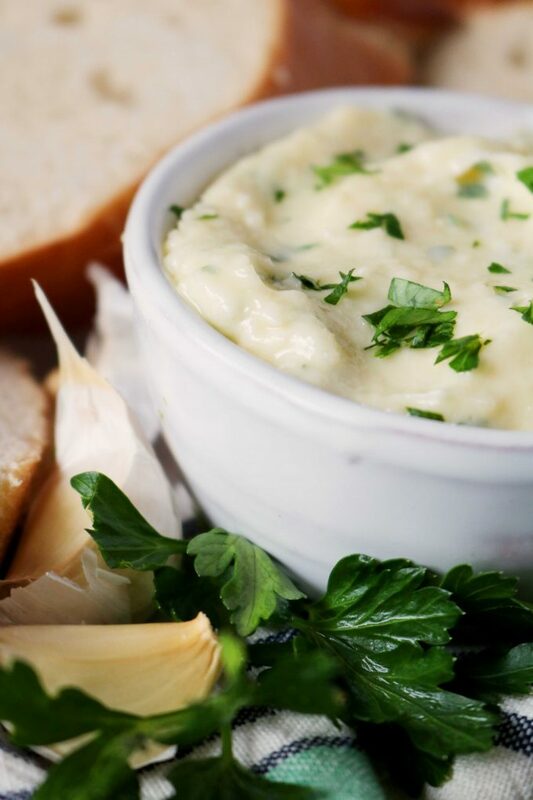 If you are using a French loaf, you'll likely need to double the garlic spread recipe. Then, cut the loaf in half (lengthwise) and spread a thin layer of spread over the bread. Bake as directed. I don’t eat bread that often but your garlic bread is seriously making me salivate right now girl! Ha! Thank you! It really is worth the extra carbs 😉 Promise! I don’t have garlic bread often, but when I do, this is exactly how I want it. Absolutely perfect and just begging for a plate of spaghetti and meatballs – and wine. There must be wine! Oh sister, you and me both 😉 The perfect trifecta! Garlic bread is sooo addicting. I love the parmesan cheese in this bread… soo yummy. You can’t beat homemade garlic bread. The perfect partner to a hearty pasta dish. Garlic bread is such a serious weakness of mine! This looks incredible and now I’m just going to have to make a batch! 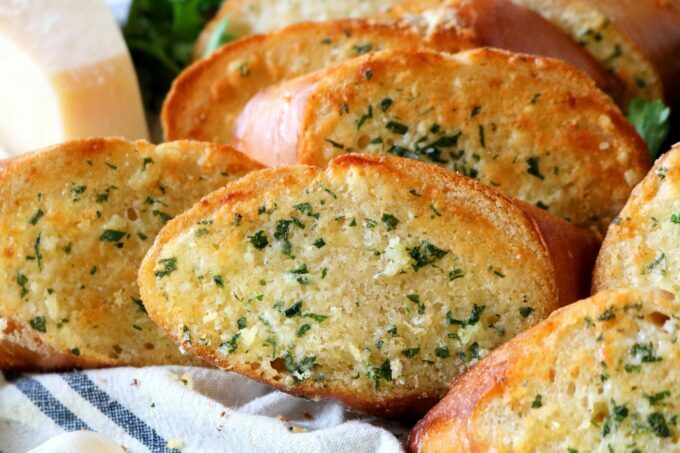 I adore garlic bread and yes, bakery bread makes the best GB! Your photos are beautiful! 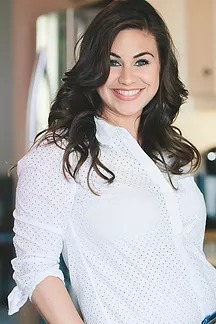 It’s such a simple recipe but divine and I can’t wait to try it! I absolutely LOVE adding parmesan to my garlic bread as well. Such a hit! Definitely perfect for a pasta dish. Now I’m craving for garlic bread. Bread is my weakness, and this garlic bread is calling my name! It looks fabulous! It’s rare that I indulge in bread, but when I do I LOVE garlic bread! This is exactly what I want with a bowl of spaghetti marinara. Its the perfect way to scoop up all of the deliciousness and also enjoy all those great garlic flavors at the same time. Garlic bread is best and homemade garlic bread is better. I can imagine my garlic bread with Parmesan on it with a bowl of soup. When I want to go the extra mile, I make garlic bread for my hubby. His eyes really light up when he finds out we are having garlic bread. Your recipe is so easy I could make it every night, but then it wouldn’t be special. Saving this, thank you! Thank you so much, Tina! My husband loves it too! Two of my favourite things in one title – Homemade and Garlic Bread!! I love your recipe and I want to make these RIGHT NOW! That looks super tasty with plenty of garlic butter. YUMMM! oh yes! Homemade garlic bread is exactly what I need! I can imagine the aroma in the house of freshly baked bread…) saving the recipe! We could all use a little more homemade garlic bread 😉 Thank you, Veronika! I love love love homemade garlic bread! I’ve never used Day old when I make mine so can’t wait to try with that! Guess we are having Italian tomorrow! 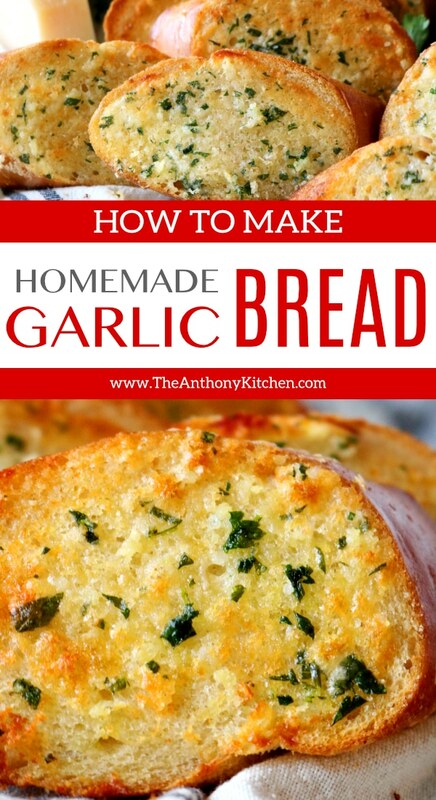 Garlic bread is one of my favorite side dishes, especially for pastas or baked chicken. Definitely going to be giving your recipe a try.